The Insurance Leads Blog is your key to getting the latest tips on insurance and financial advisor marketing. This is where you'll find our latest articles on street smart direct marketing and prospecting strategies that will help you fill your appointment book! In depth all web leads review that will reveal the truth behind allwebleads inc.
Continue reading "All Web Leads Review"
Selling life insurance. Tips and strategies from top producers. Selling life insurance is easier when you use proof combined with a winning sales formula. Continue reading "Selling life insurance. Tips and strategies from top producers." Write referral letters and use this marketing system to generate referred leads that want to do business with you. Continue reading "Referral Letters and Marketing"
Where to buy free health insurance leads and how to follow up and close them. Continue reading "Free Health Insurance Leads"
If You MUST Cold Call For Your Insurance Here's How To Do It! Continue reading "If You MUST Cold Call For Your Insurance Here's How To Do It!" The insurance letter templates by MyInsuranceLetters.com are reviewed here. Continue reading "Insurance Letter Templates Software"
Discover a financial advisor letter that will finally generate more financial planning leads for you. Continue reading "Financial Advisor Letter For Better Marketing"
Here are two commercial insurance prospecting letters that you can model for your lead generation and sales strategies. Continue reading "Commercial Insurance Prospecting Letters"
A guide to insurance sales training and who is the best trainer. Continue reading "Insurance Sales Training"
Insurance Prospecting Letters That Get Results. Article on insurance prospecting letters and why insurance marketing letters are a dying art. Continue reading "Insurance Prospecting Letters That Get Results." Three insurance list and marketing tips that will attract new clients like mad. Continue reading "Insurance List Marketing Ideas"
An amazing financial services marketing resource for insurance agents and financial planners. Continue reading "Financial Services Marketing"
Get financial planning leads and generate leads with effective direct response techniques. Continue reading "Financial Planning Leads"
Insurance Marketing Strategies and Ideas! Article describes insurance marketing strategies that set the foundation for a system that attracts new clients consistently..
Continue reading "Insurance Marketing Strategies and Ideas!" I am now doing great in my insurance business! "Hi Brian, it's always good to take credit where it's deserved. May I say thanks for your outstanding advice you are giving me through emails. I am now doing great in my insurance business. First it was not easy but after going through your advice I am now excelling. May the love of God always guide you. Moses M from Kenya." I know, some of you are saying, "Yeah, but he's in Kenya." It doesn't matter where you are. It really doesn't. A guide to annuity lead generation and other annuity marketing tips. Continue reading "Boost Your Annuity Lead Generation Response Rates"
The truth about insurance business cards and where to get good cheap cards and other business card tips. Continue reading "Insurance Business Cards Guide"
The Best Insurance Selling Tip I Ever Got! Continue reading "The Best Insurance Selling Tip I Ever Got!" This referral technique still works! This referral technique gets warm referrals in droves. It will always work for you. Continue reading "This referral technique still works!" Continue reading "Closing technique using AIDA Model"
Describe your best insurance selling tips or tip, and read other agents tips as well. Continue reading "Your Favorite Insurance Selling Tips"
Generate medicare leads by capitalizing on the new medicare drug plan. Continue reading "Getting Medicare Leads"
Continue reading "Clicks But No Conversions?" I have done a lot of reading about facebook will your report really give me anything new? Continue reading "I have done a lot of reading about facebook will your report really give me anything new?" This facebook report and guide for insurance agents will eliminate the confusion of how facebook works so you can start prospecting using their social media platform and advertising program. Time to get social media insurance marketing systems rolling to beat your competition and get more clients. Continue reading "Social Media Insurance Marketing"
Knights Of Columbus Life Insurance Marketing! Continue reading "Knights Of Columbus Life Insurance Marketing!" How to write more effective insurance letters and get a better response. Continue reading "Screaming Insurance Letters"
This company offers life insurance leads for agents, advisors, and property casualty agents, their leads are top notch, and they will match up to 15 leads free. Continue reading "Life Insurance Leads For Agents"
A life insurance letter that is ready for your offline lead generation campaign. Continue reading "Life Insurance Letter Instant Download"
My insurance marketing tips will give you a leg up on your competition, grow your business, and generate more insurance leads faster than ever before. Continue reading "These Insurance Marketing Tips Gets Clients In The Door!" Continue reading "Advisor Versus Sales Person"
Continue reading "Insurance Website Templates"
Article on disability insurance leads and how to create a of disability insurance sales leads. Continue reading "Generate Disability Insurance Leads"
The secrets to getting referrals and how to them to beg you to sell them your products and services. Continue reading "Tips On Getting Referrals"
These insurance marketing video tips will give you lead genreation ideas. 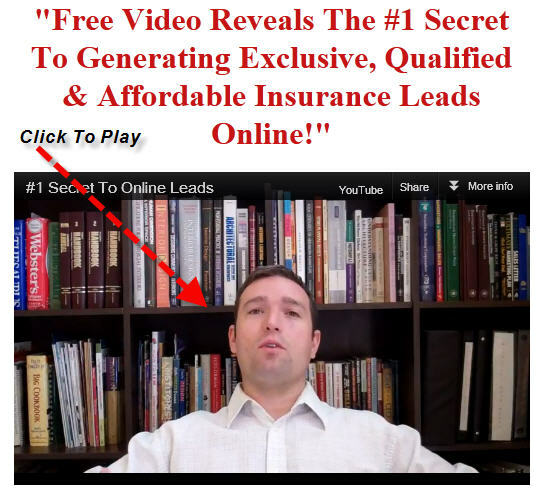 Continue reading "My Insurance Marketing Video Tips"
How To Get Internet Life Insurance Leads. Two Important Steps. A guide to internet life insurance leads. Two important steps for generting internet insurance leads. Continue reading "How To Get Internet Life Insurance Leads. Two Important Steps." Continue reading "Starting The Negotiation Process"
Insurance Referral System and Strategy! Insurance referral system works well in any country and it's a fun referral marketing idea too! Continue reading "Insurance Referral System and Strategy!"